The 13 004 ha of Čepkeliai Wilderness are embedded in the Dzukia-Čepkeliai National Park, Lithuania. The Wilderness consists of two areas; Cepkeliai State Natura Reserve and Musteika Reserve. Čepkeliai Wilderness is located in the south-eastern corner of Lithuania and forms one ecological complex, representing very valuable ecosystems of wetlands and forests, at the border with Belarus. Together with Kotra Landscape Reserve in Belarus it is transboundary wetland Ramsar area. The European Wilderness Society last week visited this area to discuss with management the next steps of cooperation. During field work in Čepkeliai Wilderness we were surprised by remoteness and size of this area, said Otto Dibelius, Legal Counsel of the European Wilderness Society. 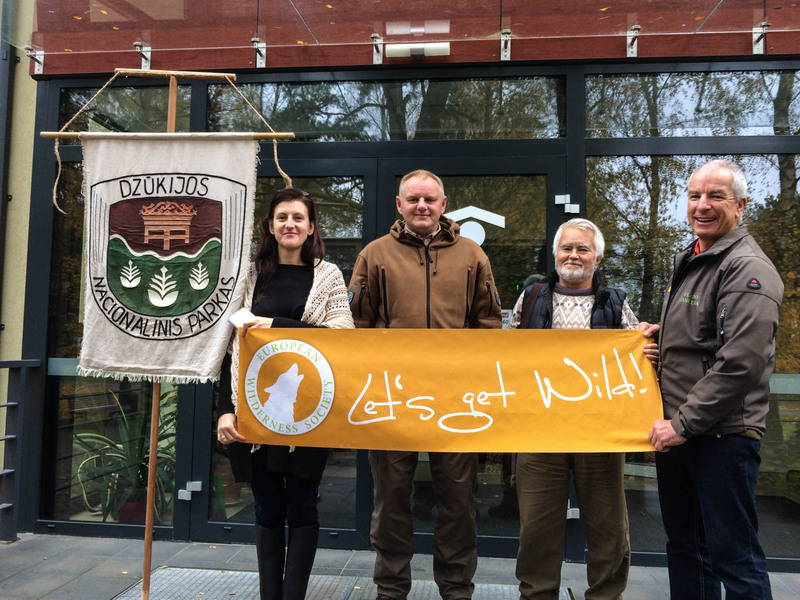 At the meeting with the Dzukia-Čepkeliai National Park Director Mr. Eimutis Gudelevičius, his deputy Mr. Mindaugas Lalepé and Inesa Karsten Head of Tourism and Information we discussed a wide spectrum of issues linked to the stewardship of this extraordinary Wilderness! We are glad to continue our cooperation. Čepkeliai Wilderness is the largest piece of Wilderness in our country and it fully deserves to be member of the European Wilderness Network. We are really proud to contribute to Wilderness conservation in Europe, said Eimutis Gudelevičius. Čepkeliai is the largest piece of Wilderness in Lithuania, which is part of the wild heart of the Dainava Forest, the largest territory of pristine, undisturbed nature in Lithuania. Since 1993 Čepkeliai Wilderness protects habitats for a number of threatened species. Most of the forests in the Čepkeliai Wilderness are dry pinewoods that are rich in lichen, and cowberries, which grow on the dunes surrounding the bogs. The Čepkeliai Wilderness has an enormous variety of habitats and species of rare plants and animals abound. It provides nesting grounds for the wood grouse, the symbol of the Čepkeliai Wilderness. It also has the largest crane nesting sites in Lithuania. The area is home for wolves, lynxes and western capercaillie, and more than 4 000 other species of animals and plants. The 13 004 ha of Čepkeliai Wilderness was audited in 2011 under the European Wilderness Quality Standard Renewal-Audit 1.0. The next European Wilderness Quality Standard Renewal-Audit was agreed with the director to be scheduled for 2021. In the meantime, in 2018 and 2019, the European Wilderness Wilderness Auditors visit this place to support development of the Čepkeliai Wilderness Stewardship plan.